It Weighs five Penny-weight. The upper Mandible of the Bill is brown. The Under, yellow. The Head blue. It hath a white Spot over, and another under each Eye. The Upper-part of the Back is of a yellowish green. The Rest of the Upper-part of the Body, Wings, and Tail, of a dusky blue; the scapular Feathers having some white Spots. The Throat is yellow. The Breast, of a deeper yellow, divided by a dark blue Lift. The Belly white. Near the Breast some Feathers are stain'd with red. The Feet are dusky yellow. The Feathers of the Hen are black and brown. These Birds creep about the Trunks of large Trees; and feed on Insects, which they gather from the Crevices of the Bark. They remain the winter in Carolina. The Trunc of this Shrub is slender. Sometimes two or three Stems rise from the same Root to the Height usually of ten Feet. The Leaves are in Shape like Those of a Pear. 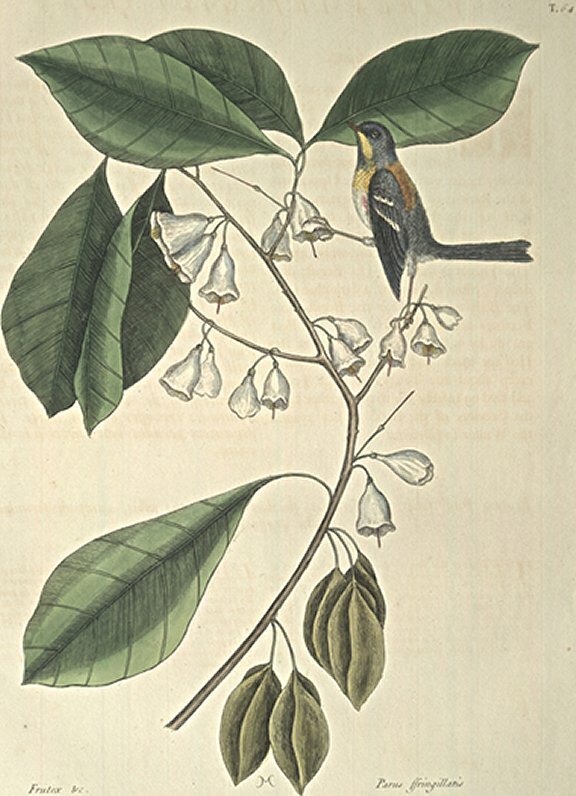 In February and March, come white Flowers, in Form of a Bell, hanging usually two and three together, on Inch-long Foot Stalks, from the Sides of the Branches. From the Middle of the Flower shoot forth four Stamina, with a Stylus extending half an Inch beyond them, of a reddish Colour. These Flowers are succeeded by oblong quadrangular Seed-Vessels, pointed at the Ends.